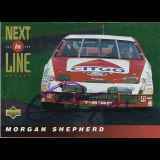 Morgan Shepherd is an American stock car racing owner-driver. He competes in the NASCAR Nationwide Series, driving the No. 89 Shepherd Racing Ventures Chevrolet. He is a born again Christian who serves as a lay minister to the racing community. He has been competing in NASCAR for over 44 years. Shepherd became the second-oldest race winner in 1993, when he won the spring race at Atlanta at the age of 51 years, 4 months, and 27 days. Shepherd became the oldest driver to lead a Nationwide Series race at the age of 70 when he led 3 laps in the 2012 Virginia 529 College Savings 250 at Richmond International Raceway. He was also the oldest to start a Sprint Cup race at the 2014 Camping World RV Sales 301 at age 72. New Response (Success): 1991 Action Packed x 2; 1994 Traks Premium and 199..
New Response (Success): Sent an SASE, LOR and a couple of 8x10's. Both cam..